The families of the recently engaged Priyanka Chopra and Nick Jonas are having a whale of a time, and the social media posts are proof of that. 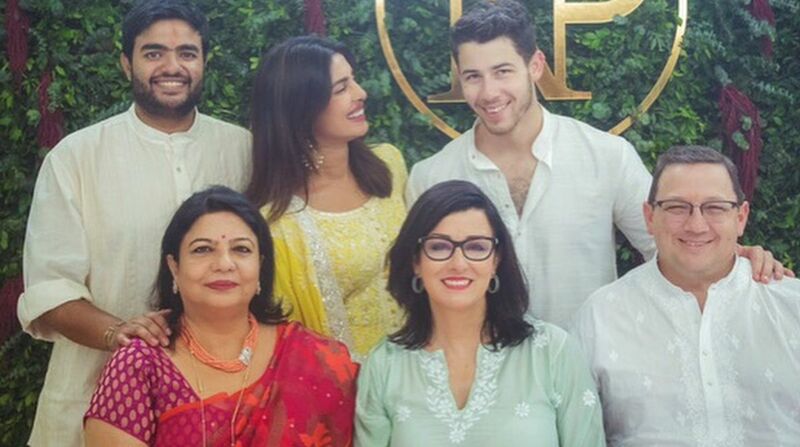 Madhumalati Chopra, Priyanka’s mother, and Denise Jonas, Nick’s mom, took to the dance floor together and matched their steps to a Punjabi song at the engagement ceremony of the two stars. Not only was the 18 August celebration the first time the couple’s families met, it was also the perfect setting for some dancing. Also read: Priyanka Chopra loves the idea of getting married, are you listening Nick Jonas? On Tuesday, the American singer’s mother fondly remembered the festivities on Instagram. Denise quipped about her lack of dance skills as she shared a video from the engagement party. “Thank you, Madhu for being patient with my lack of dance skills! I miss you. #engagementparty,” Denise captioned the clip. Priyanka’s mother recently gushed about Nick’s father on Instagram, posting a photo of the pair at the engagement party. “New reason and season for joy,” she wrote. Read more: Has Ed Sheeran secretly tied the knot with Cherry Seaborn? Meanwhile, Priyanka is back in LA. She was recently spotted after a brunch date with Nick Jonas. The couple was first linked up when they attended the 2017 Met Gala together. Despite hitting it off, the pair didn’t become romantically involved until the following year.